Belgium international Thibaut Courtois has urged Real Madrid to make an approach to sign Eden Hazard from former club Chelsea at the end of the season. 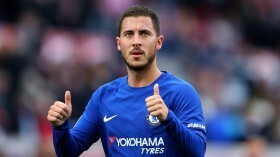 Hazard has regularly flirted with the idea of joining the European champions over the past year and this speculation has intensified of late amid his reluctance to sign a new Blues deal. This has led to several reports linking him with move to the Bernabeu giants and Courtois has now gone by the same trend by highlighting that he would like to play alongside the attacker in Madrid. "I [would] choose Eden, of course. I really like him, but the choice is up to the board. I do not know what will happen. That is not a question for me, but for the chairman and the management," he told Het Nieuwsblad. Hazard bagged a brace for the west London side on Saturday afternoon as they secured a comfortable 5-0 Premier League win over struggling Huddersfield Town.